I have been making NPCs, Monsters and Scenarios by taking inspiration from Strange Tales from a Chinese Studio by Pu Songling. You can see my last entry HERE. The next two entries (19 and 20) from the penguin edition are: The God of Hail and The Golden Goblet. In the first a man meets a god responsible for hail. It helps demonstrate the bureaucratic nature of the celestial hierarchy. I decided to create a new god based on this one. The second story, The Golden Goblet is quite interesting. A man goes into a manor house rumored to be haunted and essentially has a fine time dining with ghosts of the past. Interestingly, he seems to be able to interact with the past, taking a golden goblet from the table that he later finds out went missing. I decided to take a lot of liberties because having a fun dinner isn't the most exciting thing for a session. I added in demons and revenge to make it more gameable. 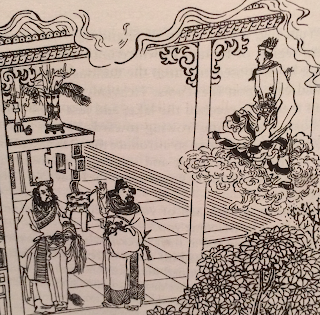 Xueren is the nephew of the Twin Thunder Gods: Queen Jiangnu and King Fengbao. He rides upon a frosty cloud and is responsible for snow and hail. He usually takes his orders from his aunt or uncle but occasionally he receives a commission from the Enlightened Goddess herself. He is also known to be greedy and has been known to take bribes from other gods or immortals to make snowfall on request. Residents of the Manor: Ruang Fuling (Patriarch), Ruang Yuan (Fuling's brother), Ruang Gao (Fuling's Son), Ruang Tung (Fuling's other son), Ruang Min (Fuling's sister), Xuanji (Fuling's Wife), Ye (household servant), Qing (household servant). This haunted manor house appears occasionally at random places. It was originally found near Zhaoze Swamp and was the abode of a retired official, Mr. Ruang Fuling. However it was the site of a terrible massacre 45 years ago when a jealous brother named Ruang Yuan, joined them for an evening of food and conversation. Ruang Fuling formerly served as a Prefect and was highly respected. Ruang Yuan was a minor magistrate and never reached the heights that his brother did. He resented his brother's refusal to sponsor him. Ruang Fuling refused to sponsor his brother because he knew the consequences for his own career would be bad, due to his brother's poor temper. If players approach the house upon seeing it, they find the host warm and inviting. He tells them he was once a well regarded magistrate (Anyone with 3 ranks in History: Glorious Emperor recognizes his name, otherwise TN 9). He asks them to join his family for food prepared by his brother. Ruang Yuan has arranged a perfect revenge against his brother. He discovered a book of recipes that were really magical spells and mastered one called the Roasted Demon Ritual. He has offered to cook a grand meal for his brother, sister-in-law, nephews and any guests who may arrive. He cooks six roasted pigs using the ritual then plans to awake them and have them attack the entire family and any guests. The manor is obviously haunted but the haunting is special. Those who enter find themselves in the house on the very night of the massacre. They have quite literally gone back in time. The effect is temporary and regardless of where they go, they return to their own time by dawn. However due to this fact, they can change the past and they can bring back objects with them (for example a ceramic pot taken from the manor house, would be missing from its own time). If they change the past by saving the Ruang family, the haunting ends and the Ruangs can rest in peace. This ritual seems to be a recipe, but it is in reality a form of Yen-Li sorcery. With it, you roast a number of animals whole. The cooking process transforms them into spirited beasts who attack upon your command. Make a Ritual (Roasted Demon) skill roll TN 6 for each animal you wish to roast. On a Success it becomes becomes a Roasted Demon and attacks on your command. Unfortunately it is indiscriminate and will attack you as well. On a Total Success the creature is fully under your command. These demons look like a large roasted pig or boar, with glazed flesh that has been slowly cooked near a flame. They have sharp black teeth and dead-looking, jelly-like eyes. However they can move as if alive and rip apart the flesh of the living with their blackened teeth. There are many types of Roasted Demons depending on which animal you cook. 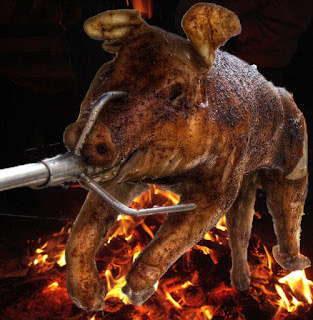 Bite: Roasted Pigs have sharp black teeth that do 4d10 Open Damage. Fiery Squeal: The Squeal of a Roasted Pig releases a blast of hot wind that burns the skin. Roll 3d10 against Evade of anyone in a 15 foot cone. On a Success they take 5d10 Fire Damage.